Farmworker Victor Hernandez, at microphone, is joined by members of Green Light NY and other groups. Rebecca Fuentes with the Workers' Center of CNY in green shirt served as interpreter. The gathered in front of Park Central Presbyterian Church on E. Fayette St.
Farmworkers in Central New York and across the state are hoping to get Governor Cuomo’s attention when he opens the state fair on Wednesday. Rebecca Fuentes is with the Workers Center of CNY. "We know we're going to have this huge celebration of agriculture at the New York State Fair. we'll all go to see the dairy pavilion, the apples, everything New York offers. Let's remember who is behind that labor." 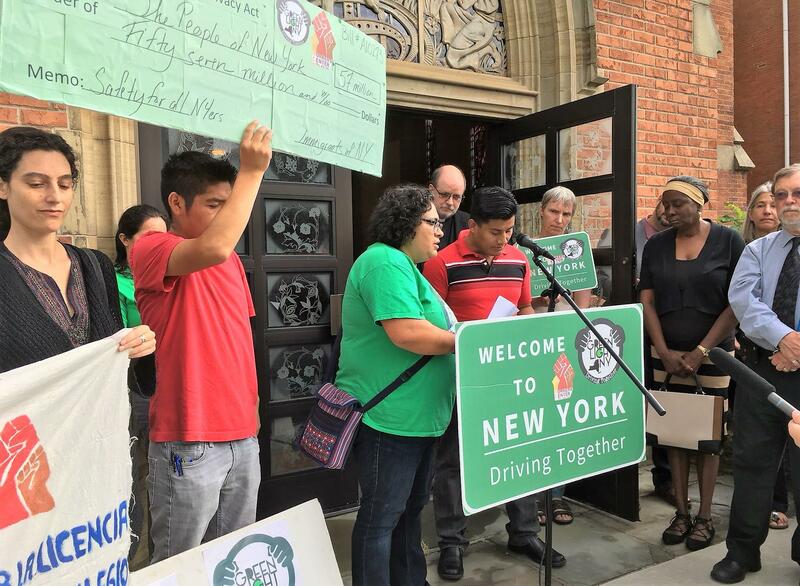 Members of the Green Light New York Campaign held events Tuesday in Syracuse, Rochester, and Buffalo asking Cuomo to sign an executive order restoring the Standard driver’s license. Dairy farm worker Victor Hernandez says it would allow residents, regardless of immigration status, the freedom to drive to the hospital, grocery store, or to take their children to school. He spoke through an interpreter. "We are here, we are part of the community. This will make it easier for us to move, without fear of the police stopping us and calling border patrol. This will continue to be the cause of separation of families. We are not criminals. We are here to work at the jobs not a lot of people want to do." Hernandez says the Standard License would improve safety on the roads, and add roughly $57 million in annual revenue to the state’s coffers through taxes and fees. "Governor Cuomo says he supports immigrants in New York. So we want see him do something. We want not only words. We want actions." Paul Weichselbaum is a coordinator with the CNY Solidarity Coalition. "Governor Cuomo has said he's a progressive and suppoter of immigrants. Let him put his money, so to speak, where his mouth is. He can issue that executive order, and can have this change happen rapidly." The standard licenses were eliminated after the 9/11 terrorist attacks, and were only briefly restored under Governor Spitzer in 2007 before being rescinded again. Syracuse Mayor Stephanie Miner announced Monday her support for a campaign that aims to give Central New Yorkers driver's licenses regardless of immigration status. 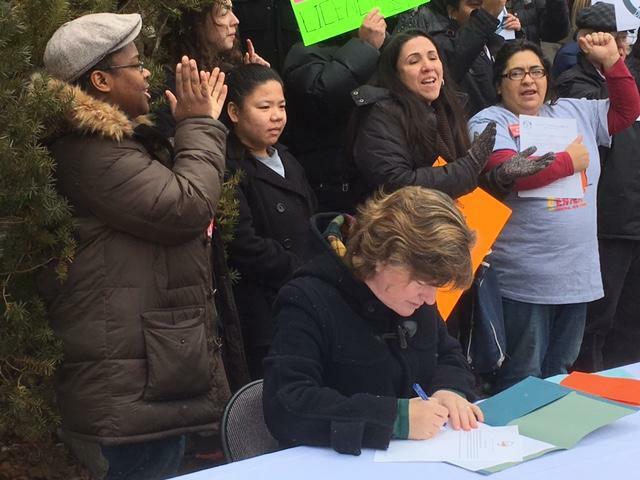 About two dozen activists at the Worker’s Center of Central New York looked on as she signed a document urging the state to approve Green Light New York. Miner says a license not only allows people to have access to community resources but also makes the roads safer. The Workers’ Center of Central New York and other plaintiffs say they’re planning to appeal a decision on a case that challenged the state’s collective bargaining law to include farmworkers. A judge in Albany dismissed the case filed by the NYCLU on behalf of a dairy farm worker who was fired for trying to organize. A new report from the Workers' Center of Central New York shows that undocumented Mexican and Central American workers at dozens of upstate dairy farms face grueling work schedules and dangerous working conditions. 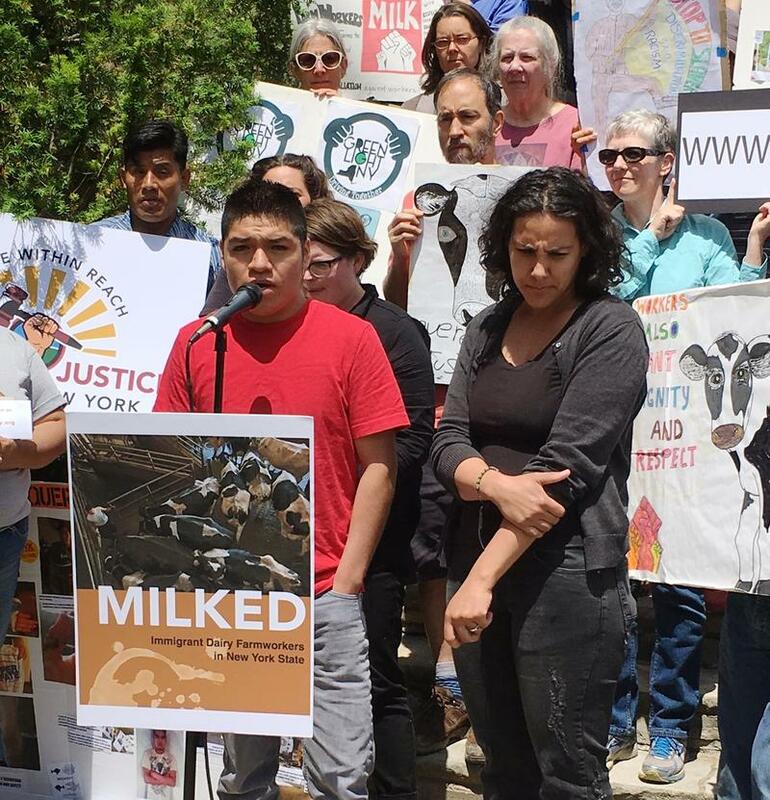 The study's release coincides with the beginning of National Dairy Month, and is called "Milked: Immigrant Dairy Farmworkers in New York State." Report co-author Gretchen Purser is an Assistant professor of sociology at Syracuse University’s Maxwell School.